Timy Fairfield learned to climb in the Sandias before climbing was cool. Now a bouldering legend, he boosts the sport from his Duke City home. which must have been purpose-built for boldering. JUST EAST OF ALBUQUERQUE, a patch of bus-size, globular granite boulders stand sentry in the Sandía Mountain foothills. Nearly every rock climber in New Mexico knows them as U-Mound. If car racers have empty stretches of highway and basketball players have blacktop, rock climbers have U-Mound—a place to gather, mingle, give beta (as in advice), and show off. In the mid-1980s, U-Mound lured a mix of traditional rock climbers sharpening their skills on the shorter, more accessible stones and an emerging breed of scalers who wanted nothing more than to contort themselves up small stretches of granite—“problems,” as climbers call them— with few graspable features. Among these boulderers was a high school student named Timy Fairfield. He had the cocky swagger and buzzy energy of a rocker, combined with the athleticism of a competitive skier and an elite soccer player. Lithe, wiry, and compact, he sported über-eighties hair that he says “varied between Billy Idol, Flock of Seagulls, and a mohawk.” In a sport of rebels, Fairfield cranked up the revolution by climbing while his boom box blasted bands like Fugazi, Agent Orange, and Guns N’ Roses. If the other climbers were bothered by the music and attitude, they admired the kid’s talent. Fairfield defied any classical notions of vertical climbing. He moved up by going every other direction. Thanks to his strength, he could hang low by his shoulders and then leap high. Sometimes his feet swung in front of the rest of his body and he looked like a crazed acrobat. Bottom line: He was getting good and distinguishing himself among the best climbers in Albuquerque. Before his teenage years were over, this homegrown phenom would beat nationally ranked climbers and start eyeing the best of the best, an ocean away in Europe and Russia. Born in 1969 in New Jersey, Timy (pronounced “Timmy”) Fairfield was a toddler when his mother, Lucinda, moved him and his younger brother, Thomas, to New Mexico. Soon she married Steve Fairfield, who helped raise the two boys while she worked as a waitress and at hotels. Meanwhile, she put herself through school and used her education to found a financial planning firm. “That’s probably where I get my drive, from my mother,” says Fairfield. He told his parents he was going hiking, but he was really climbing with his uncle. During these covert trips to the Sandías, Fairfield mastered the fundamentals of traditional climbing with ropes, harnesses, carabiners, and anchors. Since the early days of alpinism in the 19th century, climbing was inseparable from exploring and mountaineering. Vertical athletes in California’s Yosemite National Park changed the game in the 1950s and ’60s by setting their sights not on mountain peaks, but sheer walls of granite. Boulderers went a step further by climbing even shorter rocks—perhaps 20 to 30 feet tall. Their goal was to find paths up the most absurd stones using strength, agility, and power. “In ’86, I started bouldering, and at that time it was considered practice for real climbing. It hadn’t really defined itself as an athletic discipline,” says Fairfield. To get stronger, he adopted a few unusual procedures, some pioneered out of his garage. “My friends and I would bolt pieces of two-by-four to the wall and handles to the ceiling in our parents’ garages to simulate climbing,” he says. He also worked out with gymnasts to simulate the kinds of moves he could make on the rock. Many of these innovations he kept to himself. He still does. “The millennials are more about collaboration, but I’m a Gen Xer. I came out of the Cold War. If you develop a training technique, you keep it secret as long as you can,” he says. The word on bouldering and gymnastic-style climbing, however, was not a secret. Some climbing historians credit Ameri-can John Gill with popularizing, if not inventing, the discipline of bouldering in the 1950s. Gill was a professor of mathematics who brought a keen mind and acrobatic aesthetics to climbing. 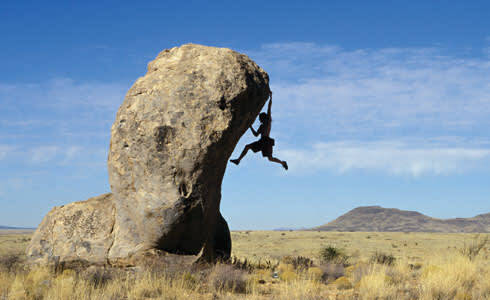 (It’s not a coincidence that bouldering routes are called problems just like math equations are.) Fairfield followed Gill’s example and moved to Fort Collins, where he attended Colorado State University and spent his free time gripping granite. Joe Crotty, a climbing companion and former world-class tennis player, took note of Fairfield’s abilities and suggested in 1988 that it might be time for him to compete at an open. Until then, Fairfield had climbed as a largely spiritual exercise. He hadn’t really thought about professional prospects. “Joe convinced me to compete when I was 19, and I did well, I placed second,” he says. He won that spot by beating a handful of nationally ranked climbers. Even so, it didn’t put him on the map. When he got done sulking, he decided to take some action. Fairfield accepted a spur-of-the-moment invitation to the 1995 indoor Speed Climbing World Cup in Birmingham, England, the night before the event. Much to his surprise and that of his competitors, he logged victories in head-to-head matchups and in the overall speed competition. He found a method of cutting across the artificial climbing wall that left his legs free, giving him something of a shortcut and saving time—a technique he used to beat the undefeated defending world champion from Russia in the final round. The win changed Fairfield’s fortunes entirely. He had an incentive to train harder and muscle his way up the European talent pool. In hindsight, he says, “It’s all right to be put on your back a little bit.” Within three years he had begun regularly placing in the top ten at international events, distinguishing himself as one of the few Americans to make a name in European climbing. Between 2004 and 2005, Fairfield transitioned out of competition and into route setting—mapping the courses for other climbers—for ESPN and the Outdoor Life Network. In a way, planning these televised events placed even more pressure on him. If Fairfield created a bad route, it could ruin the contest. He also had to stay in shape to anticipate the skills of the newest waves of athletes. Even now, Fairfield is so strong that last year, at age 46, he recorded a V15 difficulty boulder problem—akin to a sub-10-second 100-yard sprint. Only the best climbers in the world could hope to replicate that feat, and most of them are 10 to 20 years younger than Fairfield. These experiences, coupled with a lifetime of climbing, led Fairfield to coaching and advising from his base in Albuquerque. His Futurist Climbing Consultants helps a growing number of indoor climbing gyms customize their walls for everyone from professional athletes to families at play. Work is under way on a new commercial climbing gym in Albuquerque. He also advises California-based Mad Rock Climbing on shoes designed specifically for his type of climbing. Climbing took Fairfield to more than 40 countries across the world, but he keeps his home in Albuquerque. At his most successful and at his most troubled, Fairfield always found solace and motivation in New Mexico. He and his wife, fellow champion climber Brandi Proffitt, built an exercise facility in their backyard and an improvised climbing gym in their garage. Recently, the couple purchased a tract of land near Taos, where they hope to carve out a base camp to explore new climbs in northern New Mexico. They pondered “retiring” in other areas, but gravitated back to New Mexico, where Fairfield learned his craft. Here, when his feet hit the rock, he knows precisely where he is. —Jason Strykowski is featured in “Storytellers." 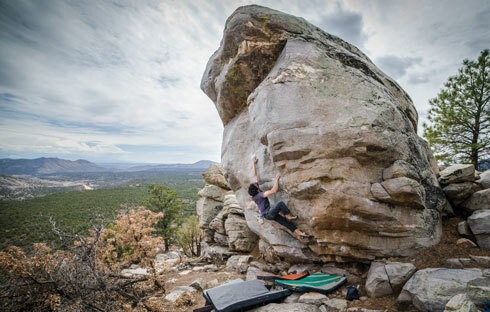 New Mexico is peppered with great spots for climbing, many within easy driving distance of cities. While some of these locations are great for beginning climbers, novices should get training first. Some spots are appropriate for boulderers with minimal equipment such as “crash pads” (reinforced mats that cushion climbers from the ground on short climbs) and specialty climbing shoes. Others require ropes and protection. Helmets are always advisable. The great indoors may be the best place to get started. New Mexico has two climbing gyms that offer introductory classes and opportunities to meet other climbers. In Albuquerque, Stone Age Climbing boasts New Mexico’s largest artificial wall. The Santa Fe Climbing Center hosts an active group of regulars. Both offer memberships and daily climbing. For outdoor instruction, contact the New Mexico Mountain Club. The New Mexico Bouldering guidebook provides details on a thousand specific climbs. WHY: The canyon offers dozens of routes in a relatively compact area. Many climbs are cleaned and bolted, making them perfect for sport climbing. GETTING THERE: From NM 599, take the Camino La Tierra exit south 5 miles to Old Buckman Road. This dirt road reaches the canyon’s mouth, where most climbers park. WHY: Questa Dome is peppered with traditional climbs that require advanced climbing ability and technical expertise needed to place cams, or anchors, in seams along the rock. A boulder field leading to the dome has a number of problems more suitable for early-stage climbers. GETTING THERE: Head north from Taos on NM 522. Drive 6 miles past Questa and go right at El Rito on County Road B042. Turn right where the pavement ends. After 1 mile, the road reaches a junction. Turn right and look for parking at the trailhead. WHY: Boulders pop up like mushrooms at this otherworldly location. Walking between them can be adventure enough, but many of the rocks can be climbed. Roped climbing is not allowed. GETTING THERE: From Deming, go north on US 180 for 24 miles, then northeast on NM 61 for 3 miles. Turn left into the park. WHY: Five rock walls line this canyon. Each offers a selection of bolted routes perfect for sport climbers. Boulderers happily explore the lower sections of rock. GETTING THERE: From Socorro, take US 60 west for 7 miles to Box Canyon Road. WHY: The walls are filled with opportunities for roped sport climbing. Dozens of routes make this a popular and social spot for climbers. GETTING THERE: Take US 60 west from Datil for 6 miles. Turn right on Forest Road 6; stay on the rocky dirt road for almost 3 miles to Forest Road 59, which reaches the climbs. WHY: A large network of canyons is filled with thousands of boulders composed of the best-quality rock of any sandstone in the Southwest. A lifetime of bouldering opportunities await. GETTING THERE: From NM 39 at Mills, take Mills Canyon Rd. west to Mills Canyon. From here consult the guidebook to find the various access roads that take you to the dozen or so bouldering trailheads. Above: Keenan Takahashi tackles a problem in the Ortega Mountains of northern NM. TYPE OF ROCK: Quartzite Why: The beautiful swirled quartzite is bullet hard and gives amazing, finger-intensive boulder problems that are begging to be climbed. The views aren’t bad either! GETTING THERE: The Ortega Mountains have more than a dozen bouldering areas. One of the most popular is called Nosos (pictured), located three miles north of the village of La Madera on NM 111. Either park at the pullout on the left and hike up or, if you have a high-clearance vehicle, follow the dirt road FR 121 for .7 miles, take a right, then follow this to the trailhead. WHY: A popular and convenient bouldering spot; Timy Fairfield honed his technique here while in high school. A plethora of outcroppings suit different levels of climbers. GETTING THERE: In the Sandía Mountains foothills. Take Tramway Blvd. to Copper Ave. and head east for half a mile.